Rub the corn with oil and salt, and grill until cooked. Cut the kernels off the cob. Cut the nectarines into quarters, and brush with oil. Mark each side on a grill. Once cooled, cut into cubes. Slice the tomatoes in half, then cut into half circle wedges. Season scallops with salt and pepper and grill until cooked through, about 2 minutes per side. Juice the limes, and combine with olive oil and chili powder. Season with salt and pepper. In a bowl combine the corn, nectarines, tomatoes, and arugula. Gently toss with the lime vinaigrette. Divide amongst the plates and top each plate with 3 scallops. 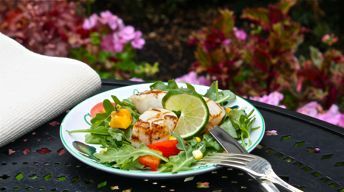 You may also substitute the scallops for chicken or your favorite fish.